With Goats Head Soup, the Rolling Stones showed some indications that the fuel that had burned in them since 1968 was starting to run out. With 1974’s It’s Only Rock ‘N’ Roll, the band was clearly in a holding pattern. As with Soup there are several real gems on this album. The highlights of the album are at least the equal of its predecessor and might even be slightly better. The lowlights were lower, though, and there’s simply no denying that an audience expecting a new Sticky Fingers or Exile On Main Street was going to be extremely disappointed. Like some of Bob Dylan’s early 70s albums (e.g., New Morning, Planet Waves), both Goats Head Soup and It’s Only Rock ‘N’ Roll sound better in retrospect. Time has distanced them from the ragged genius that cemented the Stones legend, and this allows the albums to be taken on their own merits, as well as judged by their own flaws. It’s Only Rock ‘N’ Roll is the work of a highly accomplished band. By this point the Stones knew exactly how to craft down and dirty rock and roll in their sleep. That’s actually something of a drawback in rock music. When a band reaches this level the temptation is there to coast, and that’s just what the Stones are doing throughout this period. The mid 70s were a fallow time for rock music. The wave of Sixties titans was largely over: the Beatles were no more and the solo Beatles, with the exception of McCartney who was still riding high, had drifted off. The Who were still releasing great albums but the tour following Quadrophenia was a disaster. The Kinks were releasing convoluted concept albums that made no sense to anyone. By 1974 Glam Rock was nearing its expiration date, with David Bowie, Elton John, and T. Rex peaking a year earlier. Punk rock was emitting its first cries, but was unknown outside of small venues in New York. Disco was arriving, but not quite there. The so-called Progressive rock of Yes, Pink Floyd, and Emerson, Lake and Palmer, was big in the world of FM radio, but the mid 70s were still very much an AM radio era. Where there was inspiration was in black music. Funk, reggae, and soul were big. The radio grooved to such soul classics as Dobie Gray’s “Drift Away” (which was recorded, but not released, by the Stones for this album). And as they had done in the mid 60s, the Stones turned to this music for inspiration for two of Rock ‘N’ Roll‘s best tracks. “Ain’t Too Proud to Beg” is a fierce, rocked up version of the classic Temptations song. Kicked off by Charlie Watts, a man who never played a bad drum part, and featuring both a funky clavinet and barrelhouse piano from guest Billy Preston, this is one of the most convincing non-blues Stones covers. Jagger never tries to emulate the soulful vocals of the original, opting instead simply to be himself. The soul is stripped from the song, turning it into a visceral, drunken howl. “Luxury” is the first attempt by the Stones to do pure reggae. The Stones make their mark in the guitars, which are more distorted and raw than you find in reggae, but there’s no mistaking this song as anything other than proof that the Stones were listening to a lot of Bob Marley. Reggae was a well from which the Stones would draw a lot of inspiration over the next ten years or so, but to these ears their first attempt was also their best. “Luxury” has a melody that would have made Marley proud, and the toughness of sound at which Peter Tosh excelled. It’s a shame in some ways that the Stones fell back into by-the-numbers rockers and extended ballads. With the exception of the title track, which is still about two minutes too long, there’s nothing else on the album that you haven’t heard before. “If You Can’t Rock Me” is a fine, hard-charging album opener, now rendered redundant by the fact that the Stones seem incapable of putting out an album that doesn’t have at least one song extolling the virtues of “rocking”. But as good as “You Can’t Rock Me” is, it also never rises above the level of professional, competent rock music. It’s enjoyable, and not particularly memorable. The same criticism can be leveled at the rest of the rockers on the album, but those tracks are usually not even as memorable as “You Can’t Rock Me”, which at least benefits from being the first thing you hear. “Dance Little Sister” is okay, the kind of song that sounds better live. It, too, is helped by Charlie’s unerring sense of swing. His rapid fire fills and the sterling guitar work from Keith Richards and Mick Taylor, and Jagger’s excitable vocal all combine to make something this is…meh. Once again, it’s a matter of coasting over inspiration. Yes, this is good. Coming from another band, it would probably be a career highlight. Coming from the Stones, it’s just an album track that is enjoyed, and forgotten. Far worse is “Short and Curlies,” a throwaway track that is about exactly what the title implies. It’s a dumb attempt to write another raunchy, not-fit-for-radio song in the mold of “Star Star”, and best forgotten. The Stones draw more inspiration from black music with “Fingerprint File”, this time tapping funk music. At six and a half minutes, it’s far too long and far too repetitive. The basic groove of the song is good, but there is a lengthy jam in the middle that goes nowhere. Cut down to three minutes, “Fingerprint File” might have been one of their better funk moments, but at this length it merely sounds like self-indulgent album filler. With “Angie” from Goats Head Soup, the Stones hit chart gold and discovered singer/songwriter-ish balladry. “Till The Next Goodbye” is It’s Only Rock ‘N’ Roll‘s “Angie.” A spare, acoustic number with lilting piano from Nicky Hopkins and a lovelorn lyric and vocal from Jagger, it’s actually a better song than “Angie.” But once again, it suffered. Because “Angie” came first, and the Stones were likely wary of putting out a too similar ballad as a single, this lovely song is almost unknown. 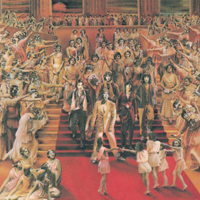 “Time Waits For No One”, which immediately follows “Till the Next Goodbye”, is both a genuinely great Stones track and a prime slab of Radio Friendly 1974. Although it was not released as a single (it creeps toward the seven minute mark), the sound of the song almost defines the era. “Time” is the ballad version of Sticky Fingers‘s”Can’t You Hear Me Knocking.” It’s a lengthy song that is end-loaded with an extensive guitar solo from Mick Taylor (his last brilliant moment with the Stones). Taylor wisely avoids the “Santana lite” jazz he played on “Can’t You Hear Me Knocking” in favor of a fluid, lyrical solo. It was not only Taylor’s last truly great moment with the Stones, it was the last time such a solo would ever be played on a Rolling Stones song. It’s a sad reminder of what the Stones miss with Taylor’s absence: a genuine virtuoso who for several years managed to keep his ego in check and lend a dimension of musicality the Stones never had before and haven’t had since. As good as “Time Waits For No One” is, there’s also “If You Really Want To Be My Friend.” One of the problems with It’s Only Rock ‘N’ Roll is that there are three songs that crack the six-minute mark. The Stones have always been at their best when they were more concise. Sure, there are exceptions like “You Can’t Always Get What You Want” and the live “Midnight Rambler” but as a general rule, the more songs that hit that five and six-minute length, the more you know the Stones are running low on ideas. “Friend” is one of the low points of the album, with an overwrought vocal from Jagger and a backing vocal section from the soul group Blue Magic that is completely unnecessary. The extended, jammy fade seems designed to add gravitas to the song, but it falls flat. The Stones had been brilliant in their career, and had failed gloriously with the experimental Satanic Majesties. What they had never been up to this point was boring. The album is redeemed by the classic title song, co-written with Face, friend, and future Stone Ronnie Wood, and a handful of great album tracks, but is ultimately undone by the undeniable mediocrity of the rest. Shortly afterwards, Mick Taylor left the band to pursue stardom with the mercurial Jack Bruce in what remains the stupidest career decision in rock history. The Stones were about to change again, becoming yet another type of band. But first they needed to make a transition.